The French are in the middle of a presidential campaign that is not only costlier than ever, but also nastier. Incumbent president Nicolas Sarkozy is trailing behind the Socialist competitor François Hollande. The French Constitutional Court has approved ten candidates to run for the presidency in elections starting on 22nd April. Former prime minister and foreign minister Dominique de Villepin is not among them, because he did not succeed in convincing 500 dignitaries of the French republic to support him with a "parrainage" (sponsorship). He very bitterly complained that he, who held high offices in the first decade of the third millennium, could not find 500 French dignitaries to give their signature for his candidacy - due to pressure from the ruling conservative party (UMP) and arch-enemy Nicolas Sarkozy with whom he sat at the same cabinet table. De Villepin pointed out that "fantasist" candidates of all sorts had an easy go to fulfil the parrainage requirement. He aimed not only at the Trotskyite or the Revolutionary Communist candidates, but also at Jacques Cheminade. The 71-year-old - who first sought the presidency in 1981 - is again running as an independent. In 1995 he secured 0.28 percent of the vote. But he is hardly an independent candidate, he is the head of the ominous LaRouche movement in France and spreads their bizarre theses. This year there is no outspoken Royalist candidate who tries to make it to the Elysée Palace. In 2007 Yves-Marie Adeline, chairman of the Alliance Royale, failed to find 500 signatories. Although he could convince 250 dignitaries to endorse his candidacy, he had to give up his attempt to present a Royalist alternative to the voters. This year his successor Patrick de Villenoisy failed to find 500 godfathers to endorse him. The Constitutional Court has confirmed that there are officially 10 candidates for the French elections, after the official deadline for the presentation of 500 signatures of at least 30 departments of local administrations. 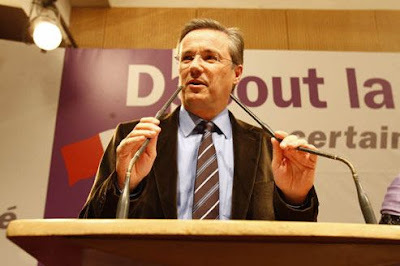 ... and monarchist Nicolas Dupont-Aignan. Strangely enough Monsieur Dupont-Aignan's party is called Debout la république and he could collect 708 signatures. Dans le souci primordial de restaurer l'État dans son indépendance et sa dignité, la Nouvelle Action royaliste confirme son rejet de Nicolas Sarkozy et appelle à en délivrer la France. Elle s'oppose, non moins fermement à la propagande xénophobe de Marine Le Pen qui nie la tradition nationale du droit du sol et qui viole, par ses diatribes antimusulmanes, la lettre et l'esprit de la loi sur la laïcité. Pour le premier tour de l'élection présidentielle, la Nouvelle Action royaliste appelle à voter pour Nicolas Dupont-Aignan, proche de ses positions sur les questions institutionnelles et européennes.